During the thirteen day run of the Big Fresno Fair, a few of us volunteer at the Fresno County Genealogy Society booth in the Home Arts building. 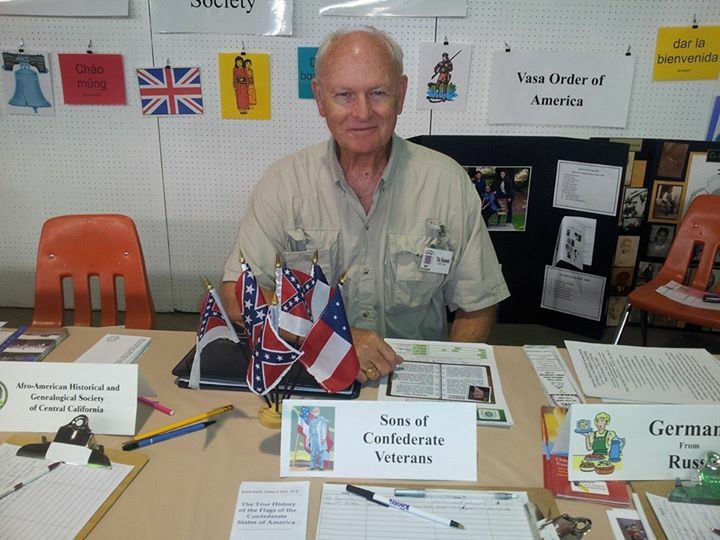 While we do help get a few new member prospects for Sons of Confederate Veterans, we do more visiting with folks who sign up for other groups represented there. Those are: German from Russia, Swedish Society, Native Daughters of the Golden West, Afro-American Society, Armenian Society, Daughters of the American Revolution, Sons of the American Revolution, Scottish Society, and a few others. The Fresno County Genealogy Society has workers on the second floor of the downtown County Library every week. Many visitors there are surprised by the many ethnic groups represented. While each group may not have a direct member there, there is a display and a signup sheet on a clip board for each group. A lot of people have difficulty finding their roots, but there are many workers willing to help you, with no formal fee as some professional genealogists can charge. This entry was posted in Uncategorized and tagged agent, author, blogging, California, commerce, control, daily blogging, ebooks, economics, editor, family history, genealogy, government, history, inspiration, marketing, media, politics, populations, problems, promotion, regional topics, roots, Story, writers by timdesmondblog. Bookmark the permalink.